This is the final blog post about my recent month long visit to California and experiences in Yosemite National Park, where I served as a park volunteer. I woke up at 6:30 and removed all the “furnishings” from my tent before sweeping the tent floor. Just as he “helped” me put up the tent, Woodlee was on the scene to help me take it down. Fortunately, he did not have to do all the work this time around. Cassie left me her whisk broom and paper towels to make sure she receives a clean and dry tent. This gal plans ahead. I spent several hours getting the tent in order. It’s going to a good home. Breakfast was simple if not heart healthy – half of a ham sandwich, chips, pears, and cookies. After breakfast and tent duties, I made a call home and then headed to the meadow for a short walk. Cassie returned around 2:00 and we completed the lodging transaction. We exchanged fond farewells before she headed out for her two-day drive to Missoula, Montana. She promised to stay in touch with all the volunteers. She is a delight and a fond memory. While I will miss Cassie, I could only be happy for her. She absolutely glowed about seeing her boyfriend again. He is one lucky young man. With completion of the transaction, I headed to Tuolumne Lodge to celebrate with an “It’s It” ice cream bar, a treat I came to relish several years ago but is not sold by the general store. Sunday evening meant live entertainment at the Mobil. Woodlee was elsewhere, so it meant just Jim and the ladies – Dee, Cyndi, and Susan. Adrienne was not up to the trip. As the ladies ate healthy and I did not (fish tacos and black beans), we made small talk, all of us overwhelmed with the realization that our close-knit group of volunteers was in the process of dismantling. Adrienne would leave Monday afternoon, after her service at Olmsted Point. Susan would leave the following evening after attending a program in the Valley. But rather than despair over our fast approaching diaspora, I suggested that we drive north on 395 to walk a boardwalk trail at Mono Lake. It proved to be just the right tonic. The high desert air turned cooler but not cold as we took in the scent of flora and fauna so very different from that of the park. 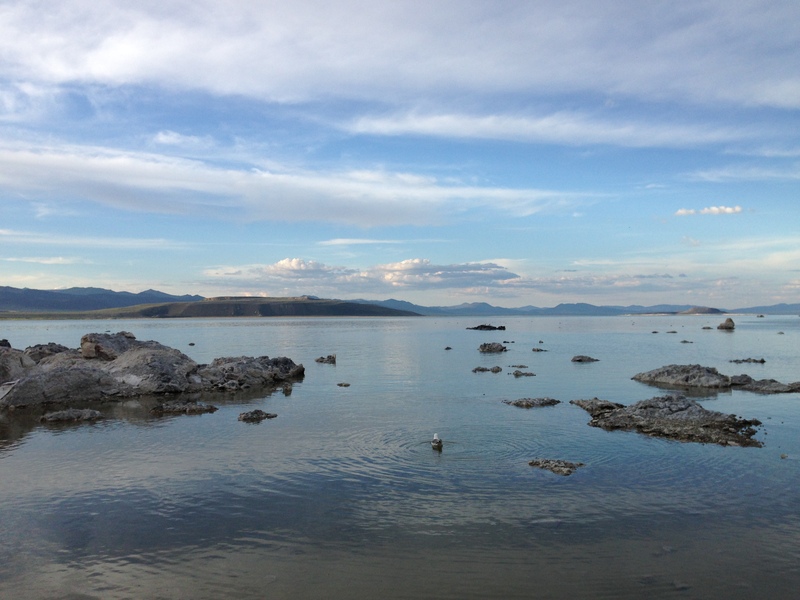 The lake is another world, adorned with tufa towers, surrounded by craters and mountains – the Mono Craters to the south, the Sierra Nevada to the west, and the White Mountains to the east. As their ancestors have done for millennia, the sea gulls feast on the insects and feed their hatchlings. Mild breezes reward the few people who enter this magical world. And we felt rewarded that we could share one more time together, having looked out for one another the past five weeks and having learned that all of us had gained more from our experience than we ever could have given in return. Off to Parsons Lodge one last time. I awoke from a less-than-comfortable night sleeping in the car. I had a two-person backpacking tent, but did not want to go through the trouble of pitching it. My body wished that I had made the effort. Before heading to Parsons, I groggily exchanged morning greetings. With fresh memories of car sleeping, I told my friends I probably will try to get a room in Reno Tuesday night after my final volunteer duties at the Visitors Center. Cyndi reminded me that her father is coming to the park this afternoon and will be staying several nights. Dee and Susan asked if I would like to join them tonight for what I understood to be the 7:00 “Stars” program in the valley. When they said they planned to dine at the Ahwahnee Bar, I could not refuse. Parsons got more foot traffic than usual. I answered any and all questions and enjoyed the delightfully sunny day, with temperatures only reaching the mid-60’s. I closed promptly at 4:00, so as not to delay Susan and Dee. As I began to leave, I was approached by a white-haired, white-bearded hiker, probably in his late 70’s, who clearly had taken on too strenuous a hike. He asked me to reach in the back of his pack for his empty water bottle and fill it with water for him. As I did so, he winced in great pain as he took the trail toward the closest shuttle stop. When I caught up with him, he thanked me for the water. I noticed he wore a brown apron and his fingernails were painted various colors. He called me his trail angel as he ambled to his destination and I hurried to catch my ride to the Valley. Susan was waiting on Tioga Road, her car filled to the brim, with room for only one passenger. After she was certain Dee had spotted her, we headed to the Valley. Once there, I wondered why the “stars” program began at 7:00. The sun would not set until 8:30. But I said nothing, as we shared one last meal at the Ahwahnee Bar. We then headed to the auditorium for the program. We ran a little late but had not missed much of the SAR (Search and Rescue) program. I’ve got to get these hearing aids checked! The subject matter held my attention far longer than any astronomy program would. Around 9:00, Dee and I said our farewells to Susan. The troops are thinning fast as we lose the kindest of a very kind-hearted group. With my poor sleep from the night before, I’m glad Dee is making the 90-minute drive back to camp. I’m convinced I can sleep more comfortably in the car than I did on Sunday. Last volunteer day, this time at the Visitors Center. I check for Reno room rates. Not happy with the quoted prices, I decide I can handle the car one more night, despite overwhelming fatigue from lack of sleep. The volunteer stint pretty much mirrored my prior experience – most people with too little time set aside to fully appreciate a 1200 square mile park. But I kept on smiling, reminding myself that I had been in their shoes 28 years ago. The afternoon got busier than usual and I found myself answering inquiries well after 4:00. But I got back to the camp by 4:45, and the last volunteers standing – Woodlee, Cyndi (with her dad, Hugh), and Dee agreed we deserved one more night at the Mobil. I would spend one more night in the car. Off to the Mobil again, this time with a deck of cards to play a game of Hearts. Cyndi got a win under her belt and we headed back up always-challenging Tioga Road (3300 feet of elevation gain over a 12-mile stretch, ever watchful for fallen rocks). On the way back, Woodlee reminded me that he had offered me a tent for the evening. I pooh-poohed the offer until the entire group shamed me into admitting that I needed a better night’s sleep. Upon our return, he brought his “one-minute” tent to my campsite, along with a mattress pad. Cyndi brought over another mattress pad. That allowed me to roll out my sleeping bag its full length, affording me the opportunity for a good night’s sleep before driving to Reno the next morning. Sometimes you’ve got to admit when you’re wrong. What a perfect way to end my summer stay, six deer grazing within 15 yards of my tent. Bleary eyed, I managed to take a photo of several of them before walking the longest 90 yards to the restroom. Adrienne – the most courageous, who overcame medical issues that would have kept the rest of us home. Intelligent and witty; I wish her a speedy recovery. Cassie – the youngest, who not only tolerated but generously socialized with a much older crew. Cool and calm, she has extensive knowledge of the park for someone of her tender age. “Chatty Cassie” because she spent hours on the phone with her beau almost every evening. Cyndi – Aquawoman, good hearted and probably the most athletic of the group – she regularly swam Tenaya Lake even after hikes that tired out the rest of us. Dee – always prepared for anything (and I do mean ANYTHING), she also regularly hosted the whole crew. The Queen of Hearts, she was the best Hearts player of the bunch. Susan – Tinker Bell of the Mountains, she hikes the park like it’s her own backyard. She exhibits an inner peace that reflects only kindness to friend and stranger alike. Woodlee – Tent Master (he can solve almost any camping equipment problem) and the most networked of us all. He seems to know someone no matter where he goes. Jim – Pathfinder (a self-deprecating title I applied to myself many years ago as I all-too-often have found myself headed off-trail) I am grateful that I had the opportunity to share a wonderful five weeks with such talented and kind-hearted people. Mid-way through my service, I swore I would not do this again due to the length of the commitment. Time will tell whether I honor my oath. During the last week, time slipped away like sand through my fingertips. The joys far outweighed the inconveniences. 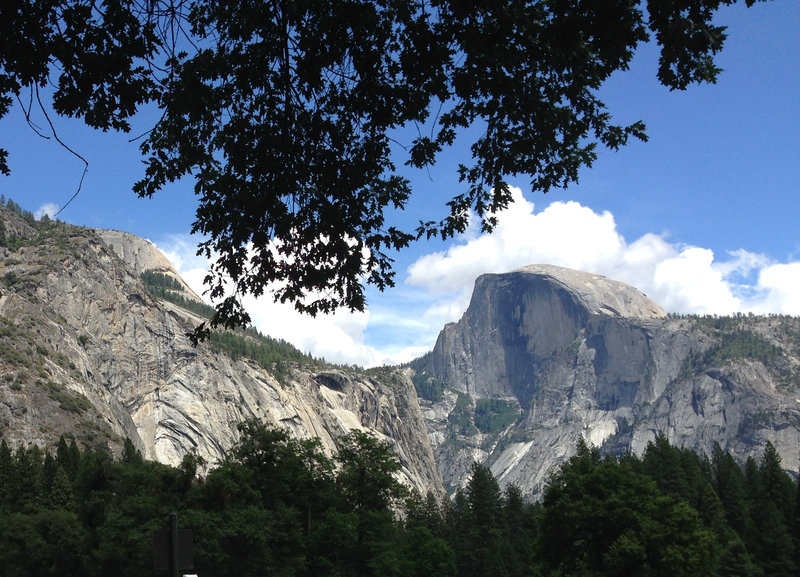 And saving one of my favorite photos for last…Half Dome. This and one remaining blog post are about my recent month long visit to California and experiences in Yosemite National Park, where I served as a park volunteer. 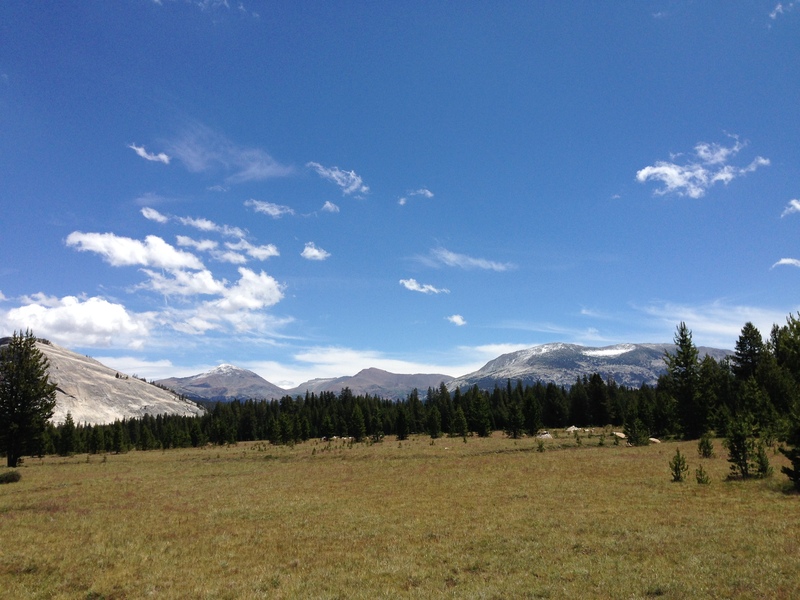 No snow in Tuolumne Meadows. Snow to the east and west, but not here. The day felt like late autumn, with storm clouds threatening again. I had nothing on the agenda and accepted Susan’s invitation to join the Conservancy’s wildflower tour of the meadows. The group gathered at the Visitors Center. Median age? I would guess 80 (and I’m 63). I wasn’t sure what to expect but I soon learned that this was a three-day affair. I planned to dip my toes in the water and see how long I would last. Our guide, Michael, explained that he would not give the name of a flower until we fully understood how the flower worked – pollinating, stamens, petals, etc. He wanted us to concentrate on how each flower functioned rather than agonizing over the proper name. Michael handed some of us magnifying glasses so we could gain an in-depth appreciation of each tiny alpine flower. While I was amazed at the first few flowers we examined, I knew my participation would not last beyond lunch. This tour may not have been my cup of tea, but it certainly tripped the other seniors’ triggers. Before I knew it, a dozen people dropped to their knees and hovered over their quarry. Anyone looking from a distance would have sworn someone had lost a contact. Again, their cup of tea, not mine. When Michael told us to head up a hill for lunch, I made my excuses to Susan and headed back to camp. Time to do laundry. That evening, the volunteers gathered at Tuolumne Lodge for our celebratory dinner on the Yosemite Conservancy’s tab. Suzy and Taryn, our very pleasant volunteer coordinators, served as our gracious hostesses. A good time was had by all, despite the mediocre food. I learned my lesson from Wednesday and ordered a hamburger with mixed vegetables, far superior to the pitiful “beef” stew (little beef and lots of potatoes) I ordered on that occasion. Then it was off to Adrienne’s “Taj Mahal” (her well-appointed RV) for cards. Susan quit while she was ahead to prepare for Day 2 of the Wildflower Tour. As has been the case with all-too-many of our games, Dee won the balance of the contest. I awoke at 5:30 and decided to check out Tioga Road as far as the Tioga Pass entrance station. Patches of snow lined the road only two miles east of our campsite. 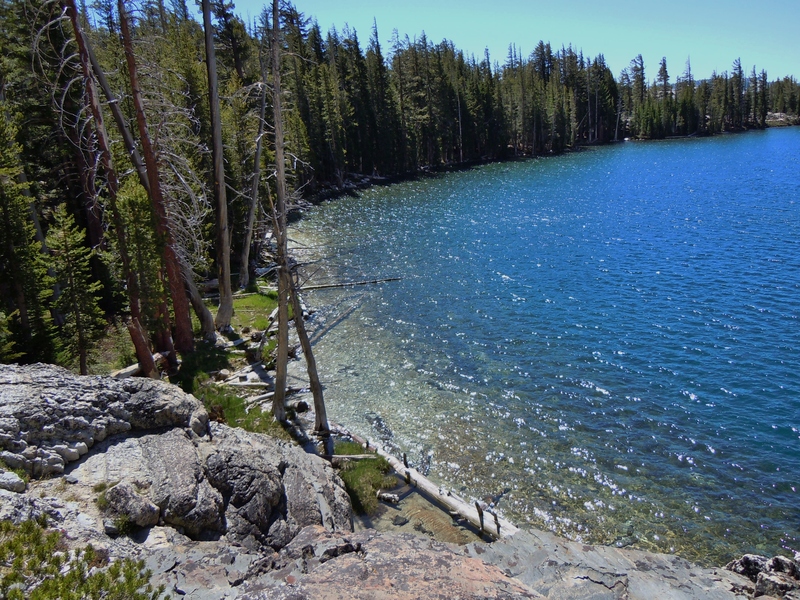 I had plans to hike to Gaylor Lakes again, mainly because I had failed to take my iPhone on my last hike. The prospects looked iffy, but I was determined. I called home around 10am and then drove to the trailhead. The trail was in excellent condition during the first 2/3 of the hike, but then turned muddy and slushy from the snow. At times I was tempted to turn back, but I soldiered on. I’m happy I did. The views from the ridge never disappoint. It’s a “Sound of Music” moment, this time with the bonus of two inches of snow left from a recent six-inch snowfall. I took my time descending the slippery trail and returned to my car. Then I was off to Lee Vining for a cherished telephone call to my daughter and lunch at the Mobil. As I finished my feast, I noticed storm clouds brewing over Tioga Crest. So, off again. The rain was off and on, but ended before I reached Tuolumne Meadows. Off to the showers before another gathering of the volunteers, this time with the welcome addition of our Yosemite Conservancy young marrieds, David and Holly. Dee once again hosted the potluck dinner, which included matzos ball soup, two types of lasagna, and sponge cake. I haven’t had access to scales while here, so I’ll be curious how much weight I’ve gained. This is the last night in my “Holiday Inn” tent. Cassie and I agreed to a price and she will make far better use of it than I ever would. She is a “camping type of girl.” But I will miss the REI Kingdom 4 tent. With sufficient headroom for me to walk around without bending, it has served as a welcome substitute to my 2-person backpacker tent. My cot and topper are reasonably comfortable and my 20-degree sleeping bag has kept me comfortably warm. Not bad digs if you can live without heat and an adjacent bathroom (and at 90 yards away, the cold-water-only restroom is anything but adjacent), something I don’t expect to experience again any time soon. As I watch the cold air fog before me, it’s time to turn in. For Mark Twain, his coldest winter was San Francisco in July. This evening, as I watch my breath fog up before my eyes, my coldest winter has the makings of being a July spent in Tuolumne Meadows. Two major hailstorms struck today, one ten minutes west at Tenaya Lake and the other twenty minutes east at Tioga Pass and Saddlebag Lake. 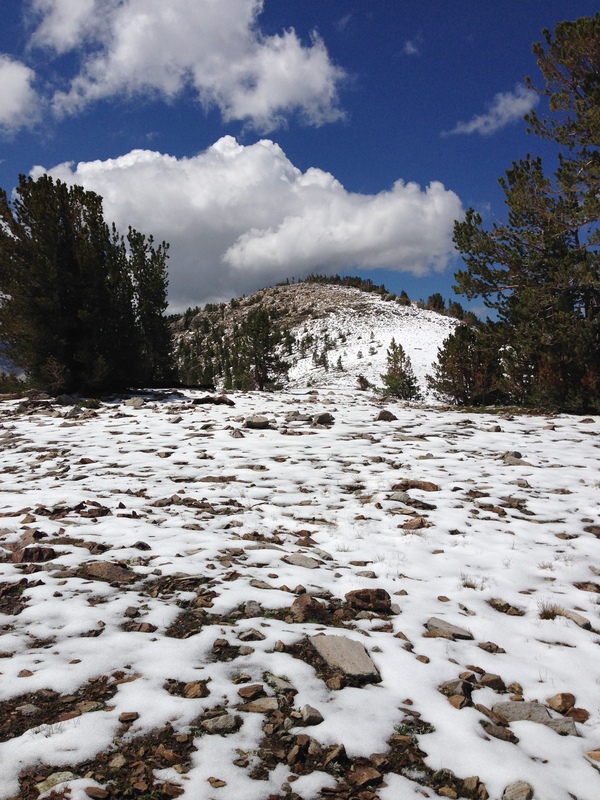 The hail storm at Tioga Pass included several inches of snow. Cars entering the park from that direction were blanketed in snow. The day began calmly enough. 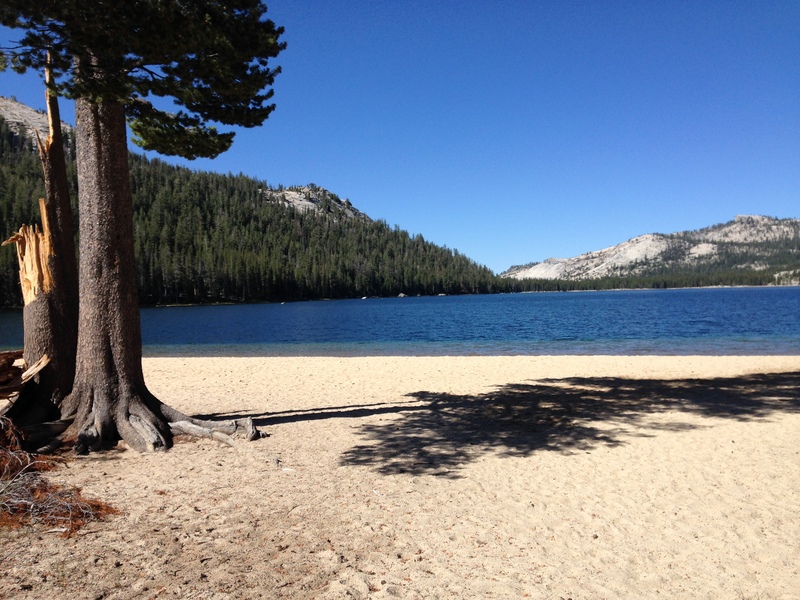 When I ate breakfast at Tenaya Lake at 7:00, I actually had to remove a jacket and the sun beat warmly on my cheeks. At 7:30, the car dashboard registered 51 degrees as I made my way back to the campground to change before heading to the Visitors Center with Cassie for my 10am-4pm shift. The meteorologist had nailed it. I could expect a day in the low 60’s. But my expectations were dashed as the thermometer dropped. By 11am, the temperature had fallen to the low 40’s. Cassie and I took turns at the outdoor booth so each of us could take a turn inside the Visitors Center for warmth. By the end of our shift, we were ready to add several layers of clothing. At 5:00, all of the volunteers headed to Tuolumne Lodge Dining Room for dinner together. I had not dined there for over 10 years, but the meal rekindled memories, some fond, some not. The dining room sits next to Dana Creek. When the creek flows at its fastest, as it did after a day of storms, the cataracts soothe any troubled soul. But the service was slow and the fare mediocre and overpriced. The contingent at our family style table included two women from Sacramento. They said their husbands preferred the comforts of their pristine homes to the beauty of nature witnessed only by trudging down dusty trails. Back to the weather. The forecast is for nighttime temperatures below freezing with tomorrow night’s low reaching 27 degrees. 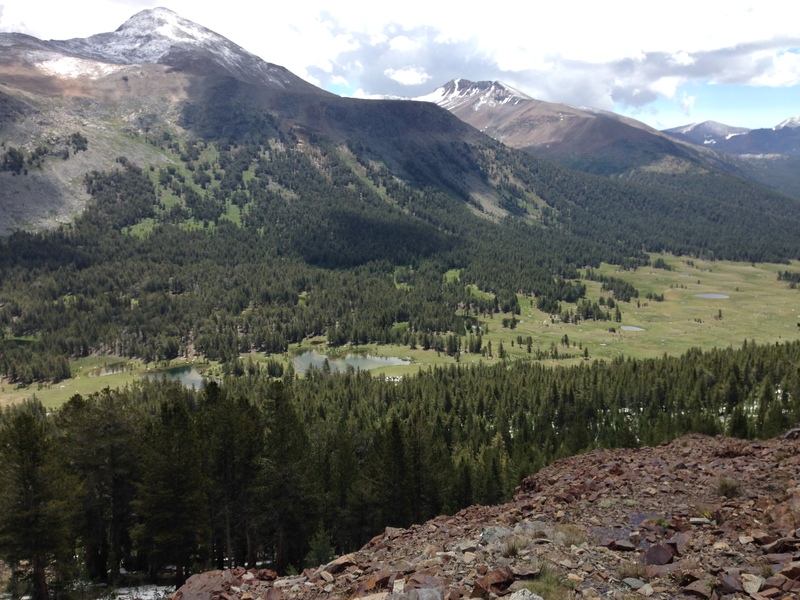 Tomorrow, I head to Olmsted Point for my last volunteer duty at that site. If it’s windy, it will be very, very cold. I had expected my tour of duty to end with warmer weather, but the mountains have a way of casting aside foolish human assumptions. I’ll update the actual weather in my next segment. No appearance at Olmsted Point today. At 6:30 a.m., I woke up to the drum roll of heavy rain on my tent. I gathered my shaving kit and headed to the Rangers facilities to brush my teeth and shave. The temperature gauge on my rental car registered an outside temperature of 41 degrees. I’ve not had eggs my entire stay, and I craved a breakfast sandwich with scrambled eggs, sausage, and cheese, so I drove to the Tuolumne Grill with my Delaware North Corp. (DNC) 50% discount card in hand. Each sandwich is priced at $6.75 and I was willing to pay that amount for two, but not for one. The cold rain had driven the Pacific Crest Trail and John Muir Trail backpackers inside the Grill and the neighboring store. I waited in line 15 minutes only to be told that DNC had changed its policy again and would not give a 50% discount to Yosemite Conservancy volunteers. “That’s ridiculous,” I said – at least the third time I had run into this obfuscation. As much as I craved the egg biscuits, I wasn’t about to fork over money to this motley crew. I drove back to the campground to check on other people’s plans. Dee and Cassie still planned to hike from Tioga Road to the Valley and return on the afternoon bus. Cyndi had left for a two-night stay in San Francisco. Susan said she would think about driving to the Valley later. Woodlee was game to ride to the Valley with me. None of us wanted to be stuck in our tents all day during what promised to be a long-lasting rain shower. 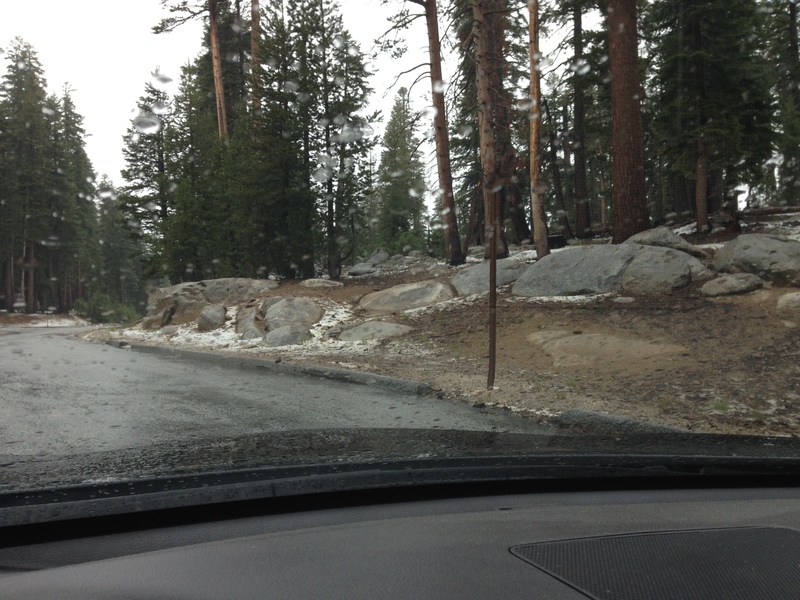 On our drive to the Valley, we saw patches of snow on both sides of Tioga Road. After heading south from Crane Flat, the temperatures rose with the drop in elevation, as did our dispositions. By the time we reached the Valley, the temperature had risen to the mid-50’s. The Valley looked much more promising than the High Sierra. Our first destination was the Food Court near Yosemite Lodge. We bought eggs, sausage, and toast. To our delight, the cashier honored our DNC discount card. After savoring the first eggs I had eaten in five weeks, we walked to the Village Store and the Ansel Adams Gallery to survey possible mementos. 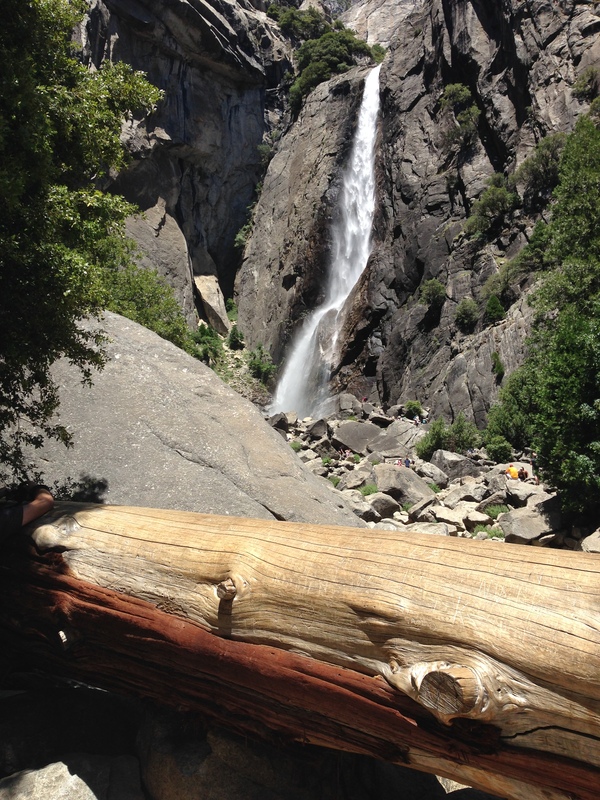 Then we were off to Yosemite Falls – respectable with the help of the mountain rains and snow but not spring time powerful. Then it was time for lunch, so we walked 1.5 miles to the Ahwahnee Hotel Bar. The grand old hotel is arguably the most beautiful in America’s national parks. It was completed in 1927 and is constructed primarily of granite, concrete and steel to protect it in the event of forest fires. Back to the bar. We waited about 30 minutes before being seated at an outdoor table. Of course the rain began as soon as we ordered, but we were under the protection of an umbrella. The food was pricey, but excellent, the latter quality a rarity in the park eateries. We decided we had seen enough of the Valley, so we caught the shuttle bus to the stop nearest the parking area, and headed toward Tuolumne. Woodlee soon fell asleep. A light rain fell as we headed north to Crane Flat and turned torrential once I turned east on Tioga Road. Hail joined the rain as the road at times appeared ready to flood. At one point, what appeared to be a 30-foot-wide creek flooded across the road. Heavy rains brought rock debris onto the road, a constant threat to blowing out a tire. Woodlee awoke after I drove through the worst of it. 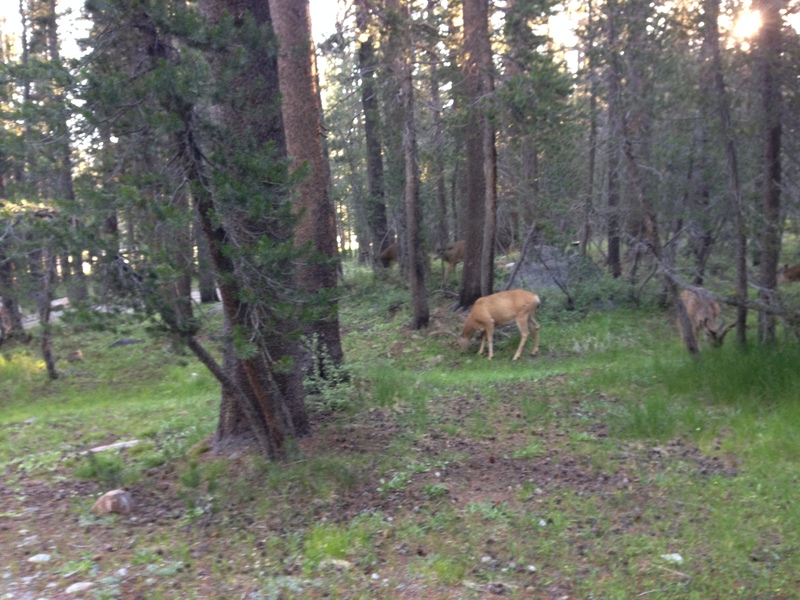 We returned to Tuolumne after 6:00 and made phone calls to the near and dear. The temperature was 41 degrees. I later joined Susan and Gary (here for a wildflower tour) for hot chocolate at Tuolumne Lodge. The good company and the warmth of a wood-burning stove provided a welcome diversion to isolation in my tent during a rain shower. The threat of snow is in the forecast, but as I write this entry at 10pm, the rains have tapered off and I hope the snow stays away. I’ll see in the morning. I wanted to go where it was warm and there were more people. So I thought. I headed to the Valley Tuesday morning. I planned to go to the Museum Library to research the Park Service Rangers. I received an assignment before I left. I could pick up the Delaware North Corp. (DNC) discount cards, good, supposedly, for a 50% discount at the Tuolumne Grill and a 10% discount at the general store. Otherwise, everyone had to wait until Friday for the cards. I got to the valley around 10am and parked in Day Use Parking. Upon arrival, I received a phone call from Suzy (YC). She said she would send the paperwork for the DNC cards to the Valley field office, and then I needed to take the paperwork to the DNC office near the Village Store. I had not anticipated this, but said “sure” and headed for the library. There, I met the librarian, who is Adrienne’s daughter-in-law. Small world. She pulled a number of books and treatises. I began reviewing the treatises. A short time later the librarian informed me she was closing the library for lunch and would return in one hour. Not a problem, I thought, as the resources seemed pretty light. 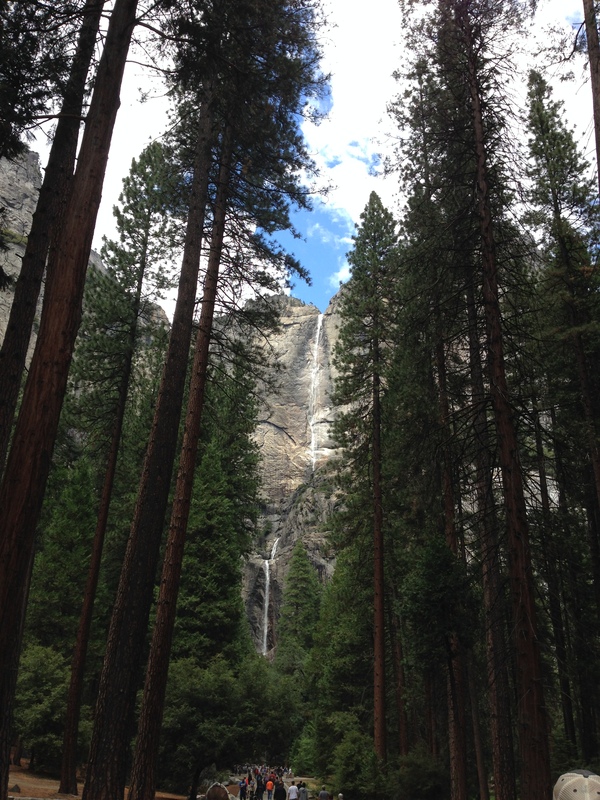 I walked to Lower Yosemite Falls. The water flow was weak but the people watching was fun. Hundreds of people, mostly children, were scrambling among the talus at the base of the falls. It’s amazing there are so few trips or falls, but that blessing goes along with being a child. I returned to the library, completed my research, and checked out one book. I then called the YC office as I watched my cell phone battery charge deplete to under 30%. I don’t think it helped that one of my fellow volunteers kept sending me the same nature photo over and over again. Although I acknowledged receipt of the photo, she never received the acknowledgment due to poor cell phone reception. Very late in the afternoon (around 4:00), the Valley YC volunteer informed me she had received the required paperwork for the DNC discount cards. I took the packed shuttle bus to Yosemite Lodge. She met me there and kindly drove me to the DNC office, where the employee initially said it would take several days to issue the cards. The YC volunteer charmed her past that obfuscation, and I soon left the premises with the cards (and a more fully charged phone, done while I waited). Back to the campground – a two-hour drive due to road construction. I need to go on a hike. Both Cyndi and I are off today, so we agreed to hike to May Lake. 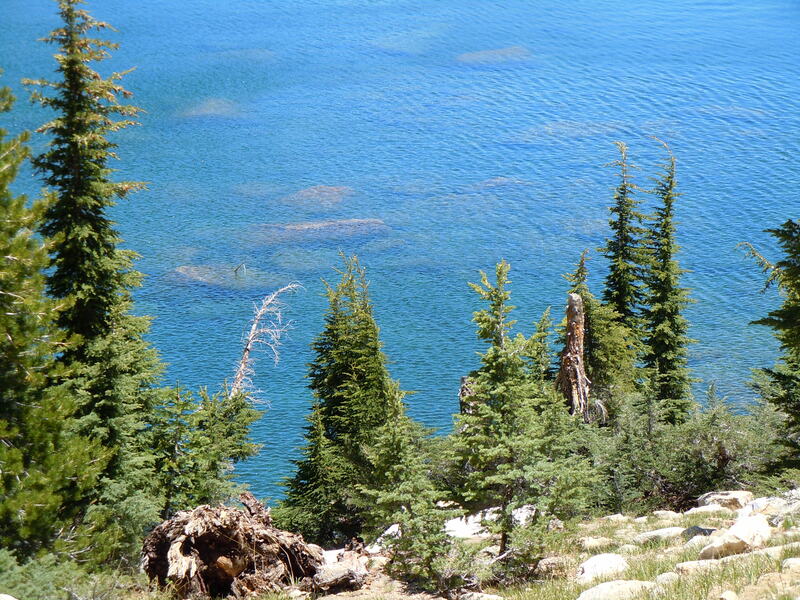 It’s a light hike, about three miles, but can be supplemented by hiking around the lake. This will be a good test for my hiking boots. We drove past Olmsted Point to the May Lake entrance. I drove two miles down a paved road to the trailhead. Several years ago I made the same hike, but the paved road was closed, which added four miles to the effort. Early on, I realized my boots were rubbing my heels. Not a good sign. I stopped after about two miles of hiking and bandaged the heels. Unfortunately, I had not packed moleskin. I soldiered on, and Cyndi and I had lunch at the east end of the lake, a rocky outcropping that affords beautiful views of the lake. After our repast, we trudged to the west shore, then hiked up the trail toward Mount Hoffman, stopping where we had great views of the entire park. Hoffman is located at the geographical center of the park, thus affording great vistas. My blisters could handle no more, so we headed back to the car. Along the way, we stopped to observe a marmot feasting on horse dung. Cyndi noted that the dung is mainly grass because of a horse’s digestive track. Nonetheless, my opinion of the marmot has dropped a notch or two. It’s still dung. I decided to mend today. Nothing meaningful to report.